A strong cheese needs an equally strong female lead. Blue and Gorgonzola cheese have a very distinct flavour; they are bold, pungent and sharp. Katsa in Kristin Cashore’s Gracling, has very similar attributes. The beautiful teenager is a fierce and tough Lady, and has been graced with the power to kill. As the king’s niece, Katsa is forced to use her special talents as a thug. Katsa struggles with how she can instead use that power as a positive tool to do good in her world. Enjoying this fantasy adventure novel is best with an English Stilton, and can easily be paired with a Port, whose sweet flavours will offset that of the salty and savoury Blue. Soft and fresh cheeses could use a light hearted book to go with it. They are also often matched with fruits and citrus flavours. What comes to mind in terms of a lovely beach read is Jess Walter’s Beautiful Ruins. Set along the idyllic Italian coastline along the Ligurian Sea, the novel travels back and forth between the small European town and modern day Hollywood. You’ll get a fictional glimpse into the set of Cleopatra, the life of Richard Burton, and the love of an Italian innkeeper. Pair Italian Ricotta and Mozzarella cheeses with some equally delicious Italian wines, such as a Pinot Grigio or Lambrusco. 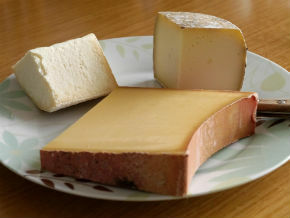 Hard cheeses like Pecorino and Parmigiano Reggiano are best paired with full-bodied whites, such as vintage Champagne or a red Valpolicella. These are best coupled up with an equally deep book. If you haven’t yet read The Book Thief, now would be the perfect time. This wildly popular novel from Markus Zusak follows young Liesel Meminger, a foster child living in World War II Germany. She quickly develops a deep bond with her new father, as well as the Jewish man who is hiding in their basement. It is a moving and inspiring novel that has touched the hearts of millions of readers. Havarti and Monterey Jack cheese, which are semi-soft and light, both deserve books that are pleasant and light. We can always use a little humour in our lives, and nothing is better than an entertaining read from our favourite comedians. These are all best with a Beaujolais or Chardonnay, to offer a balance of texture and flavour. Two ladies of laughter, Tina Fey and Chelsea Handler, both have novels that are amusing and witty, and will have you laughing out loud. Fey’s Bossypants is the story of a young girl growing up and living out her dreams; from starring on Saturday Night Live to leading in the critically acclaimed sitcom 30 Rock. Chelsea Handler has become the it-girl of celebrity roasts on her hit show Chelsea Lately, but before that she wrote Are You There, Vodka? It’s Me, Chelsea, which takes readers on a hilarious ride of stories dealing with her relationships and family. If none of these are to your tastes, you can always sit back and enjoy the novel Sideways, which is Rex Pickett’s story of two friends, Miles and Jack, who travel to the Santa Ynez wine county. There was an equally good film adaptation by the same name that starred Thomas Haden Church and Paul Giamatti. Remember to always drink and read responsibly.